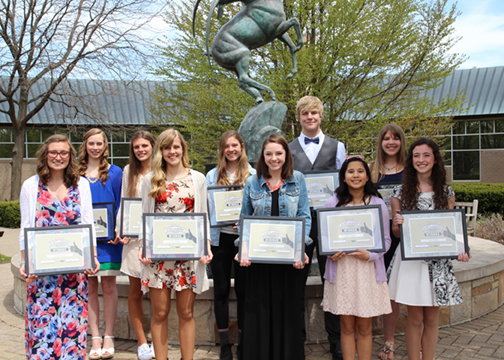 GRAND RAPIDS, MI (May 5, 2016) — Lake Michigan Credit Union (LMCU) is pleased to announce the winners of its annual Lloyd F. Hutt Scholarship essay contest. Winners were awarded their scholarship checks at a celebratory luncheon held in their honor at Frederick Meijer Gardens on Wednesday, April 27, 2016. Established in 1990 by Lake Michigan Credit Union, the annual Lloyd F. Hutt Scholarship essay contest provides local high school seniors with the opportunity to win one of ten $2,000 scholarships toward the advancement of their future academic goals. Now in its 26th year, this scholarship program honors the legacy of LMCU founder Lloyd F. Hutt and his lifelong commitment to community involvement. Since its inception, the Lloyd F. Hutt Scholarship has provided $311,500 in scholarships to 197 high school seniors. Applicants each wrote an original 750 – 1,500 word essay exploring the topic in its entirety. Essays were evaluated with greater emphasis placed on creativity, passion, clarity and originality than mechanical or grammatical proficiency. After receiving 538 submission entries – one short of the record set in 2014 – ten winners were selected by a panel of independent local judges. Entries came from 16 states; Michigan, Wisconsin, Virginia, Texas, Tennessee, Pennsylvania, Ohio, New Jersey, Missouri, Minnesota, Kentucky, Indiana, Illinois, Georgia and Florida. LMCU’s Assistant Vice President of Community Relations, Matt Cook is always impressed with the quality of essays received – and not just from the winners. ”Each year, we are quite moved by the thoughts and ideas expressed by these young adults. From following the Golden Rule to remembering the sacrifice of our veterans, the compassion and drive of the authors truly shines through. Awards are paid to recipients to provide financial assistance in the pursuit of an undergraduate degree at an accredited trade school, college or university. The money may be used for tuition, fees, books, supplies and equipment. Lake Michigan Credit Union was recently named the best banking institution in Michigan by Money Magazine. Founded in 1933, LMCU is the largest credit union in Michigan, with over 431,000 members. Employing a staff of over 1,200, LMCU’s assets exceed $6.0 billion, with a mortgage serviced portfolio of over $10 billion. LMCU now has 53 convenient branch locations overall, including ten in southwest Florida. LMCU members have access to over 55,000 AllPoint ATMs worldwide. LMCU provides a full-range of financial services, from high interest-bearing checking accounts to personal loans, mortgages, investments and commercial banking. To find out more, please visit www.lmcu.org.